Art always comes from some place. The inspiration sometimes plays a heavy hand into what the ultimate product will be. And sometimes the inspiration is so important to the artist that the execution suffers. In theater, audiences like to be entertained, but they also like to think on their own. When they’re told what the work is about, either through the program or not so subtly through the piece, it takes away the fun. In the musical Behind Closed Doors, we see a world where the government regulates sexual acts forcing the deviants to express themselves privately in a burlesque club. As a direct reaction to Prop 8, Behind Closed Doors is a mix of fun and propaganda that relies too heavily on it’s inspiration as a backbone. Despite the distractions of the story, the burlesque ensemble does a stellar job bringing this world to life. Aly French as buxom blonde Justine was phenomenal with her pure vocals. Her number “Love’s the Only Thing” was a knockout number of the production. Luis Selgas as Miles offered an outstanding layered performance. His timing was impeccable, bringing a beautiful blend of pain, bitterness, and humor. Amanda Wallace as M has a sensational voice, owning her songs, but until she is revealed as a someone else, her presence in the story is lost, giving Wallace very little to do besides belt her face off. John E. Elliott as Noah had the very difficult task of living in both worlds. His character felt very bipolar and incomplete. Noah’s intentions changed quite often but as the self-proclaimed leader, he often fell to the background. Sam Heidt played up the naivety and youthful nature of Andrew but projection and connection was his downfall. With a script so challenging, not having a someone else direct the piece was an unfortunate choice. The clarity of the world was muddled and Berube seemed to rely on the program to tell the audience about the play rather than the script. Additionally, Berube’s staging allowed for some severe sight line issues while using Dennis Berube’s four column set. There were moments that action was set behind the columns forcing some of the audience to not see actors for entire scenes. The columns, all uniform in appearance, had an interesting artwork on all sides that seemed like an arbitrary design. In a world that was so mobile, forcing some of the high heeled ladies to move the columns like dollies was a hindrance. Jesse Sheldon’s lighting design may have suffered from some technical gaffs that truly disrupted the flow, but with handheld light effect during “Love’s the Only Thing” made up for the mistakes. On the positive side, Joey Bothwell’s choreography and Amanda Wallace’s costume design worked wonders to evoke the burlesque world. 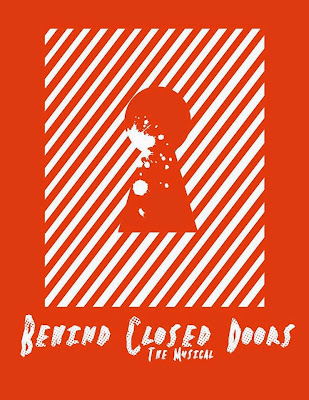 Behind Closed Doors is clearly a passion project that suffered in execution. The burlesque world was the highlight of the show but the rest of the script may need a bit of an overhaul with a dramaturgical aide. While this production may not be ready, do yourself a favor and visit iTunes and download a couple of the songs.